How do I save files for offline viewing on my mobile device? Browse to the file you'd like to make available for offline viewing. From the file list, tap the downward arrow to the right of the file’s name. Tap to make the file Available offline. 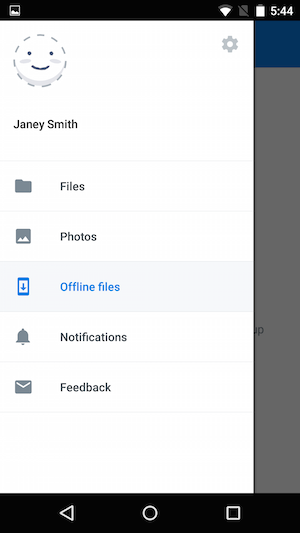 Once you've made a file available offline, and it has downloaded to your phone or tablet, you'll be able to access it any time by tapping Offline files from the main menu, even if you aren't connected to the internet. When on a cellular network (not Wi-Fi), Dropbox will try to spare your data plan. It won't update files unless you tap the Update all button from the Offline files screen. If you're about to head off to an area without internet (such as a long plane trip), tap the Update all button to ensure you have the latest version of each file. To remove a file from your Offline files screen, go to the file and tap the downward arrow to the right of the file’s name. Toggle the button next to Available offline to turn the feature off. If you have your personal and business accounts connected, you'll be able to access all of your offline files from the same screen. 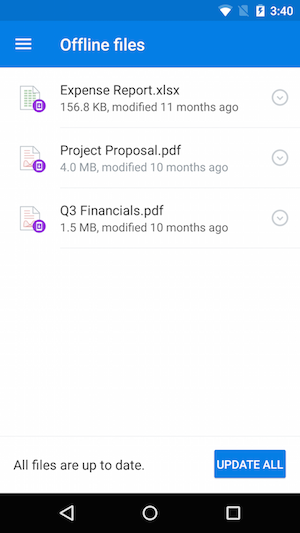 The Offline files screen allows you to view all your files together or separate them out by account, so you can keep your personal and work data organized on the go. Find the file you'd like to save offline in the file list view. Tap the ... (ellipsis) icon next to the file name. When viewing a single file, you can tap the ellipses icon (...) and select Make Available Offline. Once downloaded, you'll be able to access your offline files at any time. To ensure you have the latest versions, Dropbox will update them automatically if you're on a Wi-Fi network. If you're on a cellular (3G or 4G) network and some files have changed, tap each file to open it and get the latest changes. If you have your personal and business accounts connected, you will be able to access all of the files you have made available offline from the same tab. The Offline tab allows you to view all your offline files together, or you can view them by account type. Find the file you'd like to make available offline in the file list view. Tap and hold on the file name to reveal a list of actions. You can also make a file available offline while previewing it: tap the offline icon at the bottom of the screen. Once downloaded, you'll be able to access your offline files at any time. To ensure you have the latest file versions, Dropbox will update files automatically whenever the app is open and there's a Wi-Fi connection. If you're on a cellular network (3G or 4G) and some files have changed, tap each file to open it and get the latest version. If you have your personal and business accounts connected, you will be able to access all of the files you mark for offline access from the same tab. The Offline tab allows you to view all your offline files together, or you can view them by account. Find the file you'd like to favorite in the file list view. Swipe from left to right over the file name to bring up the action bar. How do I remove files from my mobile device?